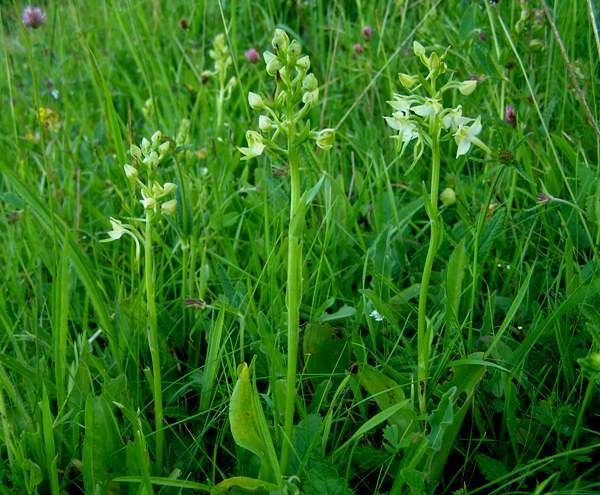 Like Lesser Butterfly Orchid, Greater Butterfly Orchid has two shiny leaves at the base of the plant with further bract-like leaves higher up the stem. It grows to around 40cm in height. The flowers are greenish-white and rather waxy in appearance. There is a long spur to the rear of the flower. 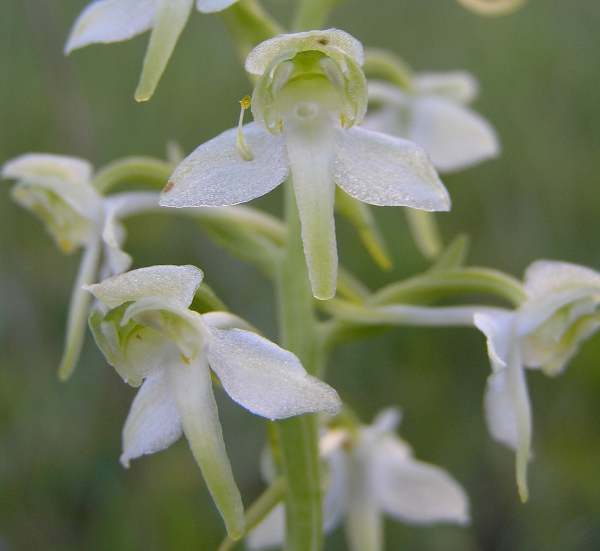 The pollinia are white (turning brown with age) and are V-shaped, unlike those of the Lesser Butterfly Orchid Platanthera bifolia which are parallel. Close inspection of the pollinia is the only way to be certain of accurate identifcation of these two orchids. This is predominantly a European species and can be found from Scandinavia in the north as far south as the Mediterranean region. It is also recorded from North Africa. Now most often found in unimproved meadows in the UK this species grows in open deciduous woodland rides in other parts of Europe. It is also recorded from dune slacks and in fenland. The specimens shown above were photographed in West Wales in June at Cae Blaen Dyffryn Nature Reserve.